The hydrogen and fuel cell laboratories at the FSEC Energy Research Center at the University of Central Florida are one of the nation’s highest caliber research labs of its kind. The equipment is used to conduct hydrogen research on production, storage, utilization and sensors, and fuel cell research on membranes, fabrication, mass transport, surface properties and electrochemical diagnostics. The Fuel Cell Lab is devoted to assembly and characterization of electrochemical devices such as fuel cells and flow batteries. In this lab, nearly every component of a fuel cell can be fabricated, from the membrane, to the catalyst ink, to the final membrane electrode assembly (MEA). Once an MEA has been assembled, it can be tested for performance or durability using single-cell test stands, or a one-of-a-kind multi-station durability test station. During these tests, the fuel cell performance or durability is evaluated as a function of temperature, gas concentrations and relative humidity. The focus at this lab is to develop techniques that reduce membrane degradation in a fuel cell application. In addition to fuel cell testing in this lab, flow battery research is conducted to improve the high current performance of the all-vanadium flow battery. The membranes that were developed for fuel cell applications may also find use in the all-vanadium flow battery system. This research positions the Energy Research Center at UCF to develop the next generation of energy storage systems for grid-scale applications. The Hydrogen Dry Lab houses many of the analytical tools that are required for successful completion of any research project. These tools enable researchers to evaluate the physical properties of the research materials, from physical morphology to chemical stability. Some of the projects that have been supported in this lab include: hydrogen sorption in metal hydrides, fluoride analysis from fuel cell effluent water, oxygen reduction reaction rates of novel fuel cell catalysts, and thermal stability of electrolyte membranes. Developed approach for conversion of biomass to diesel through Fischer-Tropsch gasification. 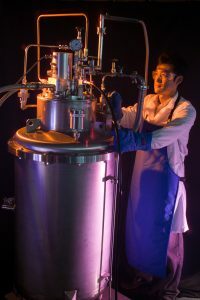 In the Cryogenic Hydrogen Lab, UCF researchers have developed a lab-scale hydrogen liquefaction and zero boil-off storage system, and a highly-efficient GM and Stirling-type pulse tube refrigerator for space application. Developed a cryocooler-cooled hydrogen liquefier and cryogen management system. Thermal analysis of NASA KSC GODU liquid hydrogen with an integrated refrigerator.